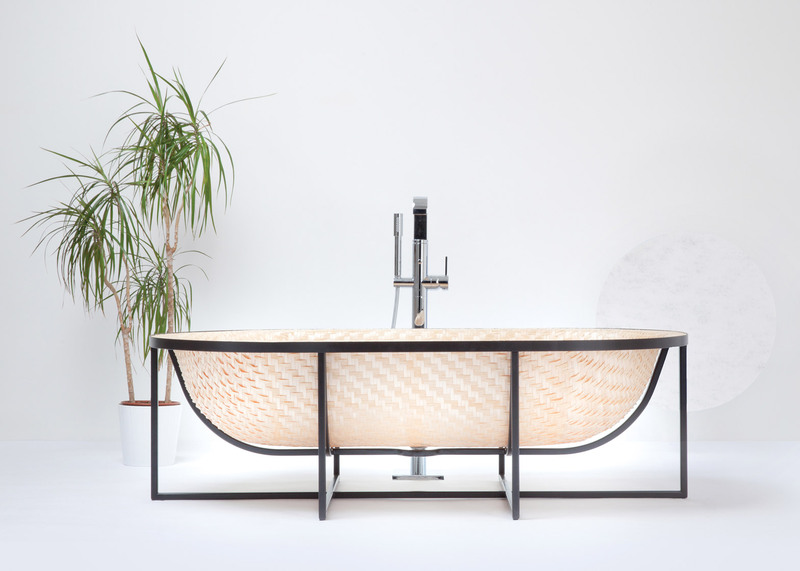 This bathtub by Israeli designer Tal Engel is woven from thin strips of wood veneer using a traditional Asian boat-building technique. Engel built the Otaku bath by weaving together strips of white ash and maple veneer to create a sheet. The material was then pressed into a form, using steam to make the wood supple enough to bend. Once dry, layers of resin were coated over the tub, adding strength and durability as well as crucially keeping the bath watertight. "The steel wire frame design, attempts to create an iconic shape which is light, yet strong," Engel told Dezeen. "The linear silhouette poetically refers to the fundamental part of the production process and closes a circle by telling the complete narrative – from the actual production to the final outcome." Finally, the wooden bowl – which weighs less than 15 kilograms – was mounted onto a powder-coated steel frame. Craftspeople in Asia have used a similar weaving technique for centuries to create large bamboo baskets for travelling on water. Engel created his bathroom piece to "emphasise a unique relationship between sailing and bathing." "This concept formulates an almost paradoxical analogy, from which the 'inside-out' theory had emerged," he told Dezeen. "The concept of washing in a bathtub is completely the opposite from the concept of floating in a boat." Other spins on the standard bathroom elements include Maren Hartveld's soft bathtub made from polyurethene-coated foam rubber and Norm Architects' collection of furnishings and accessories, including a bath perched on slim metal legs. Engel's design was presented at this year's imm Cologne design fair, which took place from 18 to 24 January 2016. Also for the event, Werner Aisslinger built a cabin covered in colourful Kvadrat textiles for the Danish brand's stand. Photography is by Tal Engel.